This will become a classic fantasy, I believe, and the movie looks fantastic! The movie’s website is fantastic, and they even have a quiz to see your daemon! 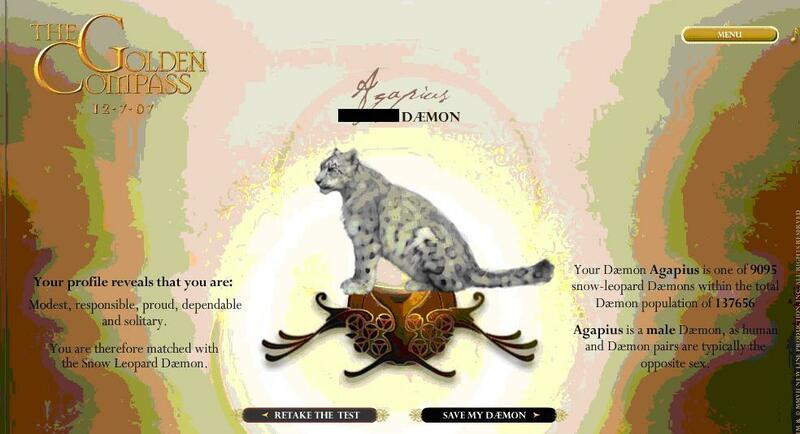 I have a male daemon named Agapius, who is a snow leopard. The book is very, very good. I read it when I was in fifth grade, but when I read it recently, I find that I enjoyed it more. Definitly for the teen audience. I love how Pullman makes sure that Lyra is your completely average girl, even a bit boring. I struggled that Lyra had no imagination, as he says in The Golden Compass, but now it makes sense. A short plot summary of this book is so hard, so I’m ending up saying- just read it! It’s very complicated, and the second book, The Subtle Knife, is a bit long. Lyra is the main character of the first book in His Dark Materials, a young school girl living at Jordan College in Oxford. She hides in a closet and listens to her Uncle Asriel give a talk about the North. From this point on, you’ll find yourself begging for no one to interupt you. The Golden Compass will lure you into it’s pages slowly, but once you’re in, you won’t put it down. The most fascinating thing in the books are daemons- souls outside your bodies that take animal form. When young, daemons can change shape, but as you mature they settle. All readers wonder what their daemon would be, and there are many quizzes on the web that will tell you. AUSTENLAND IS OUT!!! Also, the final book in Libba Bray’s triolgy, The Sweet Far Thing, is coming out this fall. SQUEEE!!! I loved the GOLDEN COMPASS. It was absolutely amazing. Actually all three books of HIS DARK MATERIALS were great. I really loved reading AUSTENLAND, too. Shannon Hale is an awesome author!! HIS DARK MATERIALS trilogy was simply amazing. I loved it so so so much! Shannon Hale is a great author… Austenland was great. I would definitely like to see the movie version of tHE GOLDEN COMPASS…..
Yay! Someone likes Shannon. You read Austenland? Wow~! HDM is a great series. That’s really cool, Anonymous! I love the name Rire. Do you know it means to laugh in french?